Hands on Manila Inc., (HOM) brings Good Deeds Day to the Philippines with a Carnival themed celebration on April 7, 2019, at the Bel-Air Covered Court in Makati City for the benefit of 200 children from the Virlanie Foundation, Bahay ni Maria Children’s Center, St. Andrew the Apostle Parish and Holy Family Home for Girls. 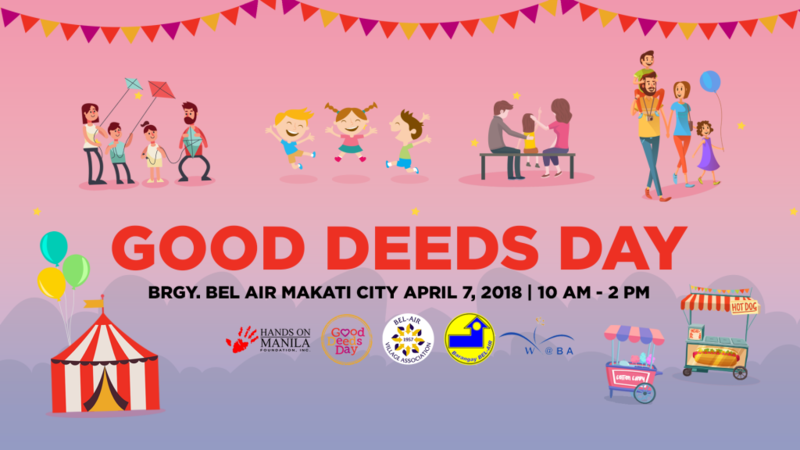 “We are very pleased to organize for the first time Good Deeds Day (GDD) in partnership with the Brgy Bel Air, Women of Bel Air Foundation and Bel Air Village Association. This is a global movement that unites people from 100 countries to do good deeds for others and for the planet,” says Atty. Gianna R. Montinola, president of HOM. To date, volunteers from Bel Air, HOM, families, and corporations have signed up to make this day a happy one for the children. “Apart from a day at the fair, children will be taught how to segregate and will learn how to recycle waste. There will be games supporting this theme and encouraging all to become EARTH VOLUNTEERS, HOM trustees Mia Villanueva and Gina Aboitiz, co-chairs of GDD Philippines 2019. The purchase of a P500.00 ticket includes a GDD t-shirt, access to the fair and coupons for sandwiches, drinks, cotton candy, and dirty ice cream for the child beneficiary. HOM-GDD is made possible with the help of BPI Foundation and Zendesk. Feel free to reach [email protected] or 0917-855-8514 for tickets.